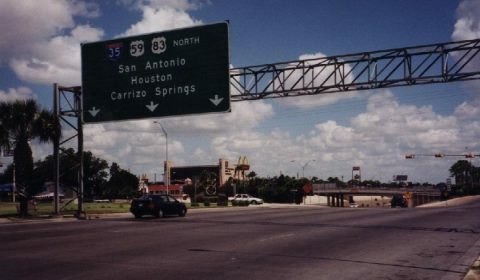 Interstate 35 serves the heartland of America, connecting South Texas with the Arrowhead of Minnesota. 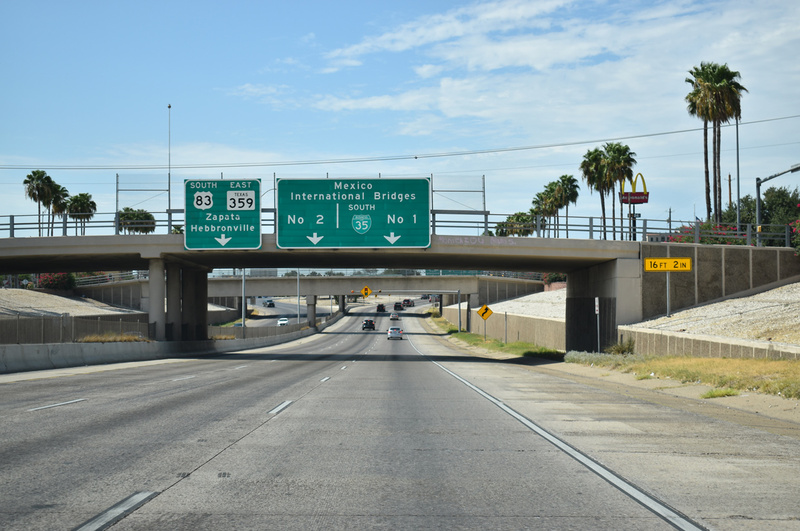 Starting in Laredo, IH 35 ventures north through an arid region to San Antonio, where it briefly overlaps with Interstate 10 by Downtown. The freeway angles northeast from there along a busy corridor to the capital city of Austin, Waco and Hillsboro where it partitions into east and west branches. 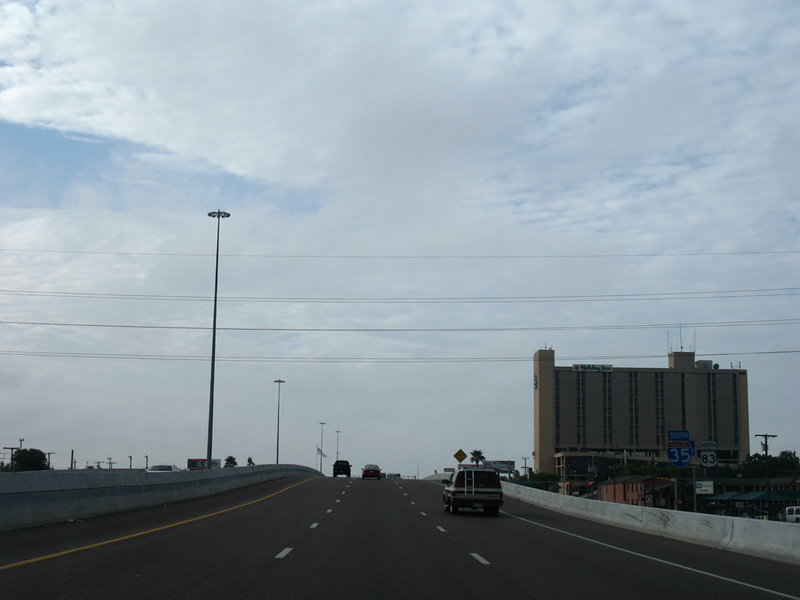 Interstate 35W serves Fort Worth while Interstate 35E retains the exit numbering scheme of IH 35 through Dallas. The two reconvene at Denton, where IH 35 resumes a northward heading to Gainesville and a crossing of the Red River into Oklahoma. Leaving the Lone Star State behind, Interstate 35 travels north to Ardmore and the scenic Arbuckle Mountains ahead of Pauls Valley. The freeway continues to Norman, home of the University of Oklahoma, and Moore, a south suburb of Oklahoma City. Once in OKC, I-35 sees overlaps with Interstate 40 to the southeast of Downtown and with Interstate 44 from Lake Aluma and Lake Arcadia. The freeway advances from Edmond and the northern suburbs along a rural course to the Kansas Turnpike and Wichita. A 123-mile section of Interstate 35 through southern Kansas overlays the tolled Kansas Turnpike. 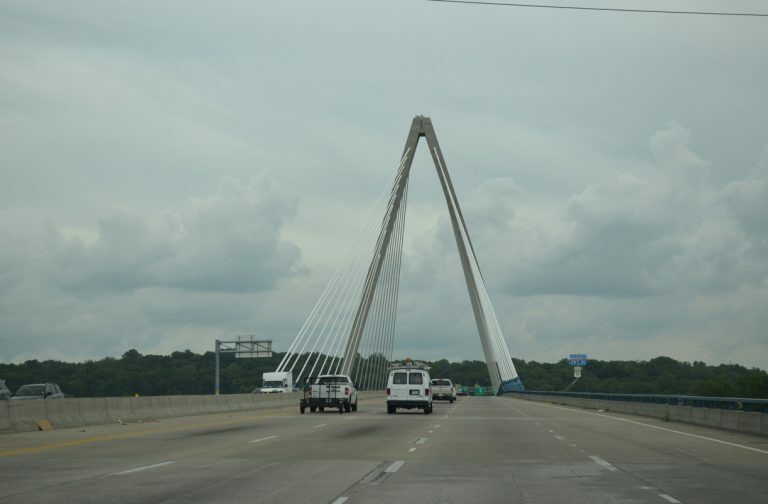 The toll road extends north from near the Oklahoma state line to Emporia. The remainder of the turnpike northeast to Kansas City includes all of I-335 and portions of I-470 and I-70. Most of the Kansas Turnpike is characterized by four lanes with a concrete barrier separating the north and southbound roadways. This view looks northeast at I-35 from the trumpet interchange with Interstate 135 north into Wichita. Photo taken 10/20/03. The northern heading of Interstate 35 shifts northeastward at Wichita, with Interstate 135 (Former Interstate 35W) branching northward to Salina and Interstate 70. I-35 remains along the tolled Kansas Turnpike northeast to El Dorado and Emporia, where it splits for an easterly route via Ottawa and Olathe. 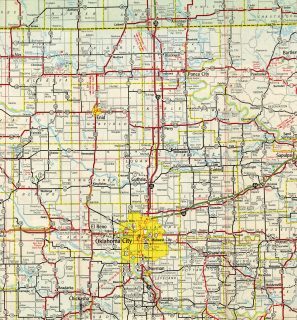 Turning more northeast, I-35 progresses through Overland Park, Shawnee and other suburban cities to Kansas City, Kansas and Downtown Kansas City, Missouri. Interstates 29, 35, 70 and 670 come together to encircle the central business district of Kansas City. 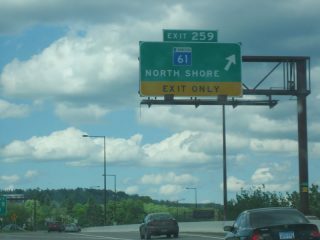 These routes form an inner belt, and the exits along the route are all numbered 2 and a suffix. This is known as the Alphabet Loop, as all lettered suffixes are used from 2A through 2Y except for the letters I and O. I-35 briefly overlaps with I-70 on the north side of Downtown and with I-29 from the split with I-70 to Avondale. Heading away from Kansas City, Interstate 35 remains suburban to Liberty and the split with U.S. 69. This stretch is home to a signing anomaly, as Missouri 110, the Chicago Kansas City Expressway, takes precedences on reassurance markers posted along the freeway mainline from Interstate 435 northward to Cameron. 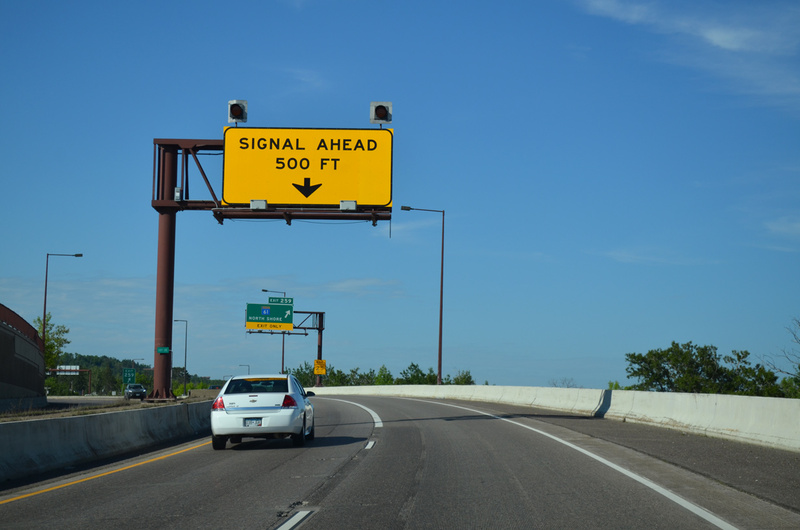 This MoDOT signing practice also exists along Interstate 44 where it overlaps with U.S. 50 to the southwest of St. Louis. There I-44 is omitted in favor of U.S. 50, as I-35 is in favor of MO 110. The terrain becomes hilly as Interstate 35 advances northward to Bethany. Crossing the Iowa state line continues by Lamoni to Osceola and the capital city of Des Moines. 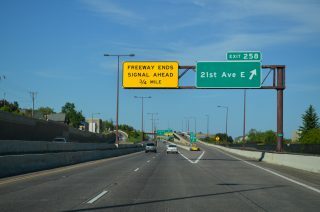 There the freeway combines with Interstate 80 to the west and north of the city while Interstate 235 serves interests to Downtown. I-35 otherwise exits the Des Moines area via Ankeny for the home of Iowa State University, Ames, and Mason City. 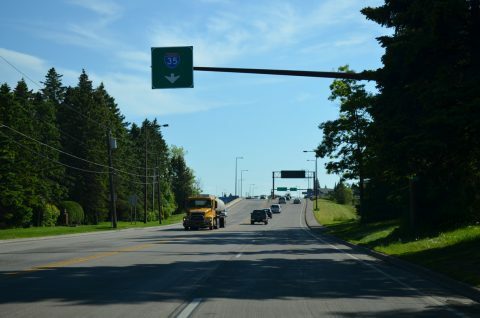 The Avenue of the Saints Corridor, Iowa 27, accompanies Interstate 35 north from U.S. 18 and Clear Lake into southern Minnesota. 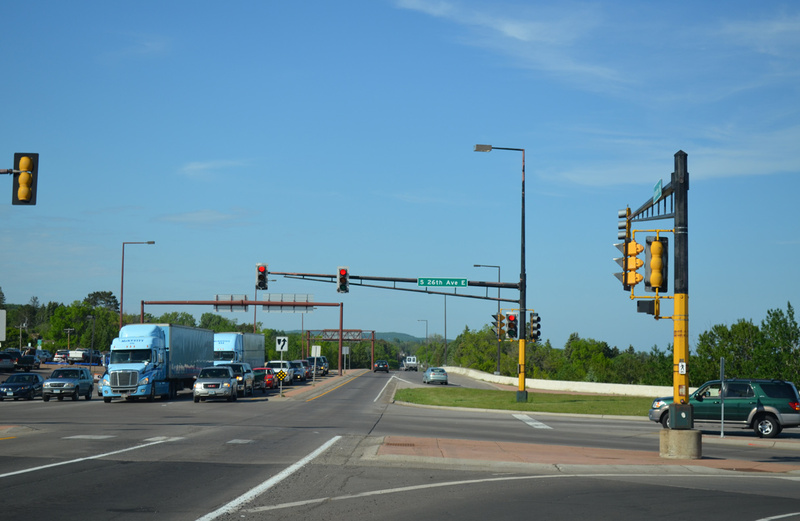 A short distance beyond the state line is Albert Lea and the crossroads with Interstate 90. 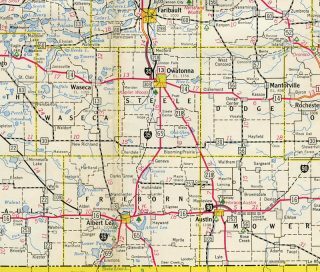 The rural freeway journeys north from there to Owatonna, Faribault and the Minneapolis-St. Paul area. Like Dallas-Fort Worth in Texas, Interstate 35 again partitions into separate branches. 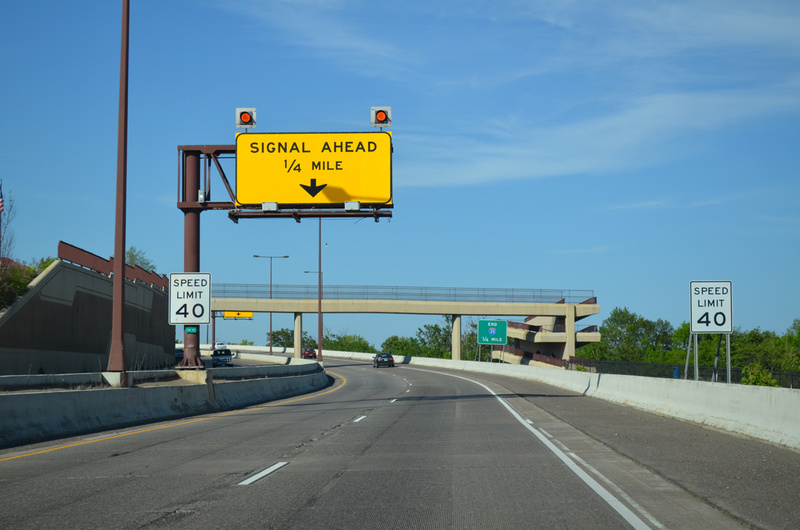 Interstate 35W stays northward from Burnsville to Bloomington, Downtown Minneapolis, Mounds View and Lino Lakes while Interstate 35E continues the I-35 exit numbers northeast to Apple Valley, St. Paul, White Bear Lake and Centerville. The remainder of I-35 extends northward from near Forest Lake to Hinckley, Moose Lake and the Twin Ports of Duluth and Superior, Wisconsin. Proponents of the Interstate 35 Corridor refer to it as the “real” NAFTA (North American Free Trade Agreement) highway, since the proposed NAFTA Highway (Interstate 69) is currently incomplete. 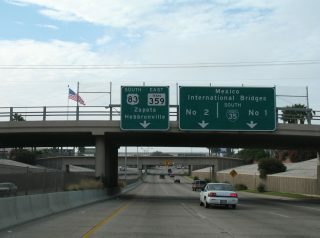 I-35, together with Interstate 29, provides a direct freeway connection between Mexico and Canada. Interstate 35 begins at the International Border with Mexico at Laredo and terminates at Duluth, Minnesota, 148 miles southwest of the Canadian line, thus nearly affording it border-to-border status. Interstate 35 in its entirety is part of High Priority Corridor 23: Interstate Route 35 Corridor. 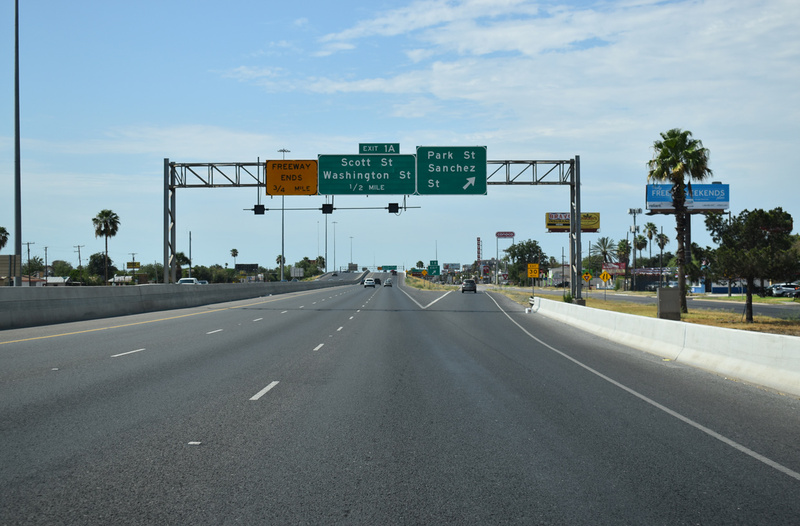 Interstate 35 replaced all of U.S. 81 from Laredo north to Hillsboro (I-35W replaced U.S. 81 northward to Blue Mound and Wautaga). The southernmost 18 miles doubles as U.S. 83 as well. Overlaps further north include U.S. 190 between Belton and Temple, U.S. 77 from Waco to Hillsboro (I-35E maintains an unsigned overlap with U.S. 77 northward through Dallas) and U.S. 77 again from Denton to Exit 1 in Oklahoma. U.S. 77 parallels or overlaps with I-35 through Oklahoma to Tonkawa. Shorter overlaps also exist in the Sooner State with U.S. 70 and U.S. 64. 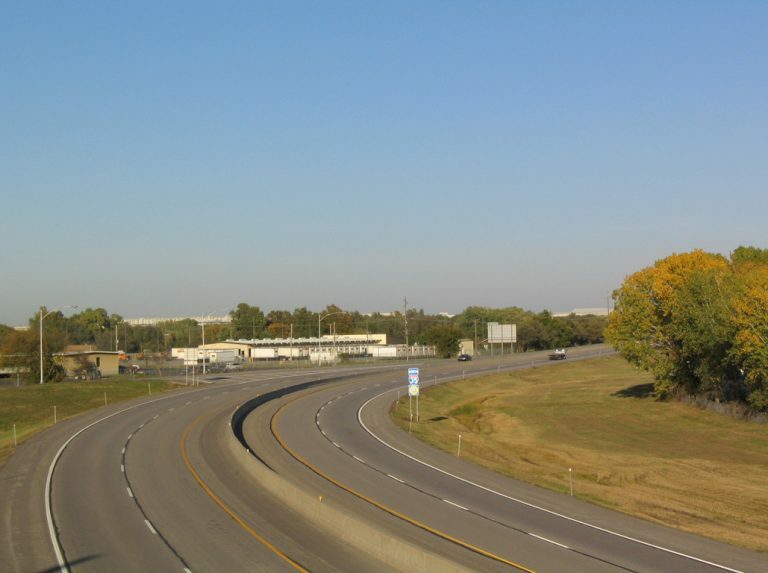 U.S. 81 rejoins the Interstate 35 corridor from South Haven to Wichita in southern Kansas. Where I-35 leaves the Kansas Turnpike, U.S. 50 takes over as the parallel highway or cosigned route. The pair head east from Emporia to Interstate 435, where U.S. 50 parts ways for Lees Summit, Missouri. U.S. 56 east from Gardner and U.S. 169 north from Olathe also join I-35 northward to Overland Park. There U.S 69 briefly forms a four-way overlap with the freeway before U.S. 56 & 169 separate for Shawnee Mission Parkway at Merriam. U.S. 69 follows suit and parts ways for the 18th Street Expressway north into Kansas City. The Alphabet Loop also sees U.S. 24, 40, 71 and 169 tie in at various locations. Heading north from there, U.S. 71 accompanies the I-29 & 35 overlap, staying with Interstate 29 to St. Joseph. This leaves I-35 to travel solo briefly before U.S. 69 rejoins the corridor from Claycomo north to Osceola, Iowa and again from Des Moines to Blairsburg. 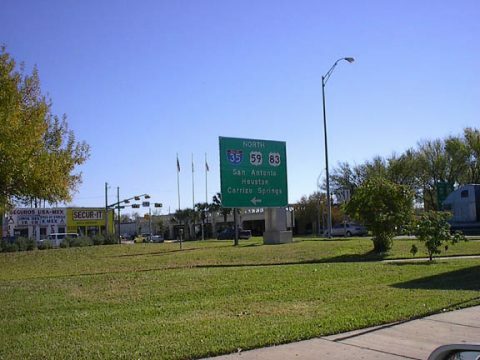 U.S. 18 overlaps with I-35 at Clear Lake. 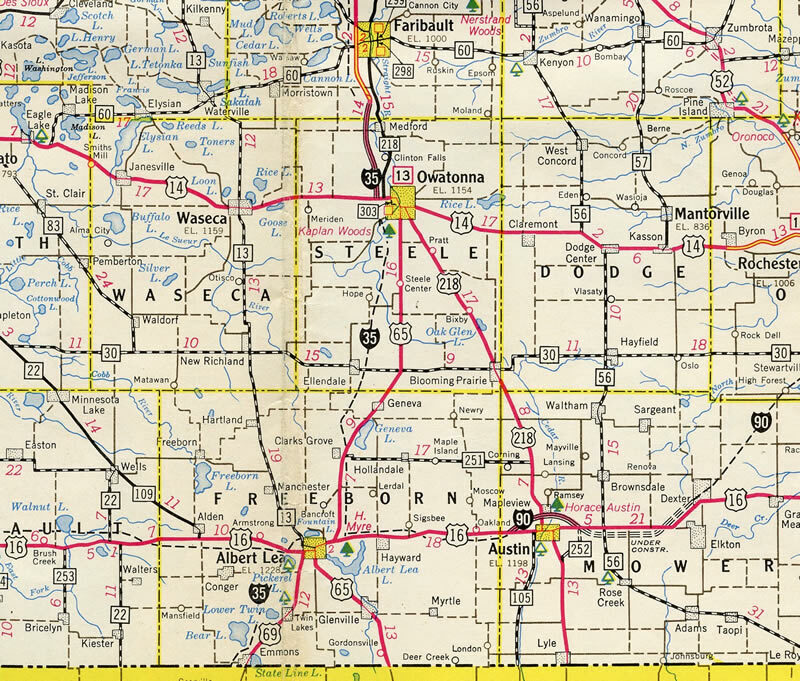 Northward into Minnesota, U.S. 65 and U.S. 69 come to separate ends at Albert Lea. U.S. 69 ends at Minnesota 13 (former U.S. 16) west of Downtown while U.S. 65 ends at I-35 south of Interstate 90. 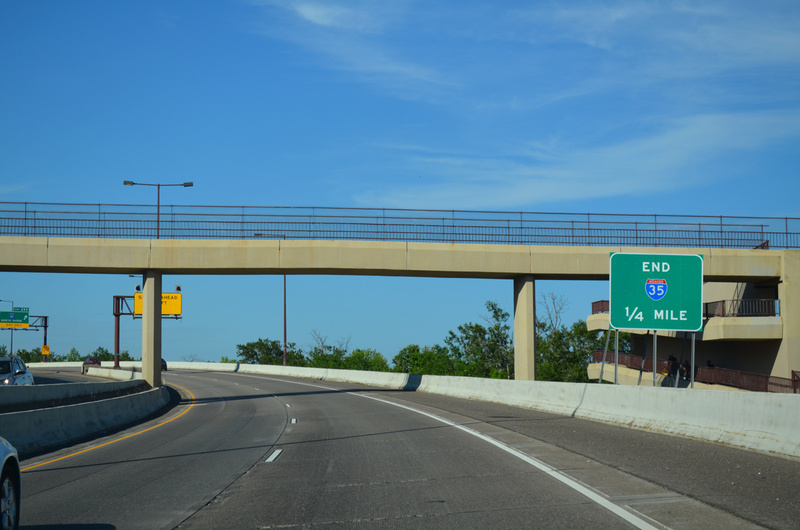 U.S. 65 historically ran north along what is now I-35 to Minneapolis. 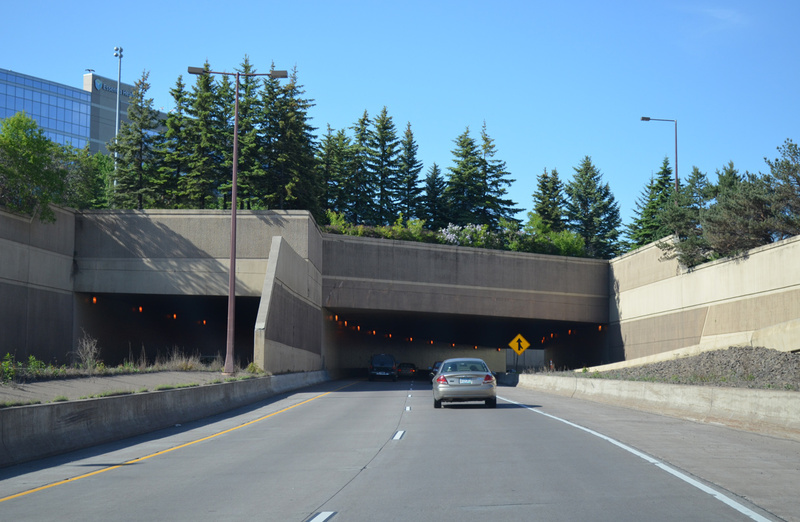 Another truncated route, U.S. 8, paralleled / overlapped with I-35W from Downtown Minneapolis to Forest Lake. The route now begins at I-35, one exit south of the truncated end of U.S. 61. 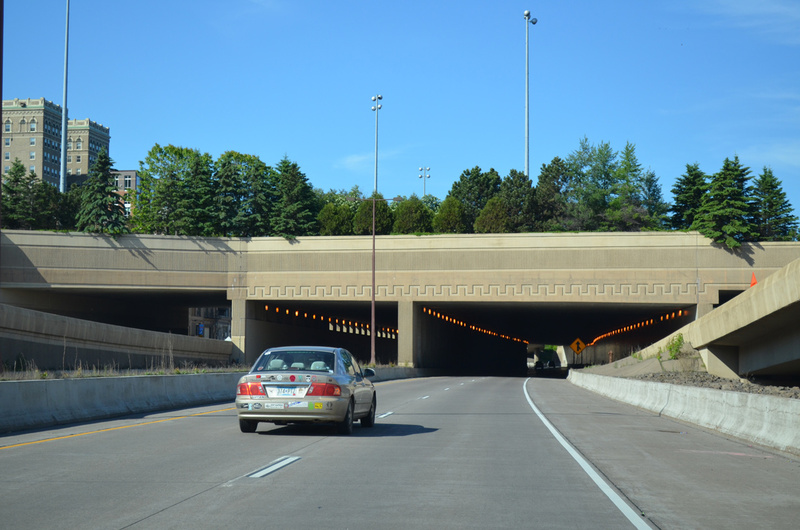 Historic U.S. 61 lines the I-35 corridor northward from Wyoming to Duluth. Until 2013, when Interstates 69C and 69E were established, the only two remaining split routes (route numbers with a letter suffix indicating direction) in the Interstate Highway System were the Interstate 35 branches through Dallas/Ft. Worth and Minneapolis/St. Paul. 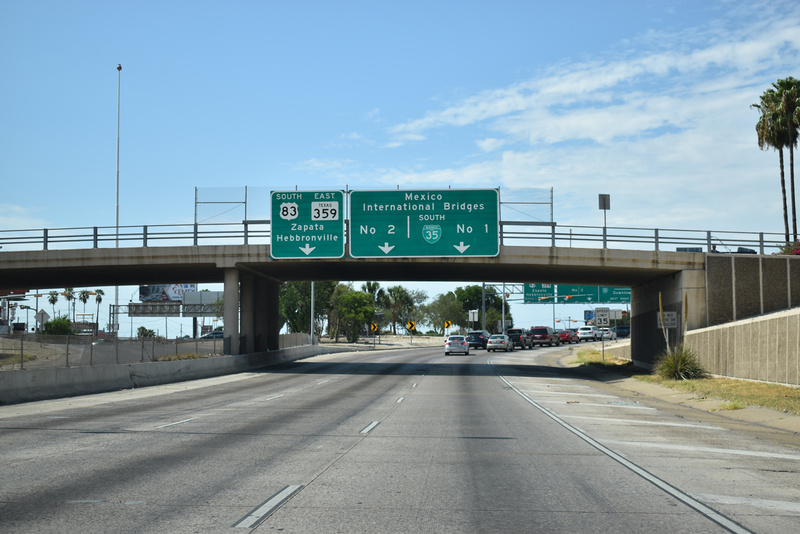 The other suffixed route along I-35, Interstate 35W between Wichita and Salina, was replaced with Interstate 135 in 1976. Within Texas, Interstate 35 was an original Interstate Highway, and it was approved by the Texas State Highway Commission in 1962 with 492 miles (figure includes both Interstate 35E and 35W).7 The segment of Interstate 35 through Austin was completed in 1962. 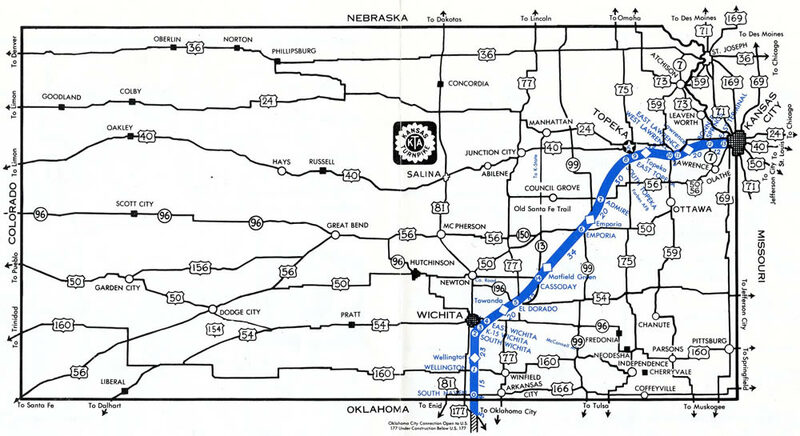 Interstate 35 was open to traffic from Purcell, Oklahoma north to the Kansas Turnpike by 1962. This included the overlap with Interstate 40, though the west split interchange was only open for through movements along I-35. 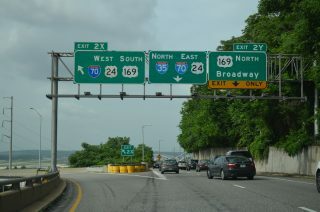 Interstate 35 follows the west leg of the Alphabet Loop along Quality Hill to combine with I-70 & U.S. 24-40 along the north leg of the loop encircling Downtown Kansas City. Photo taken 06/18/15. 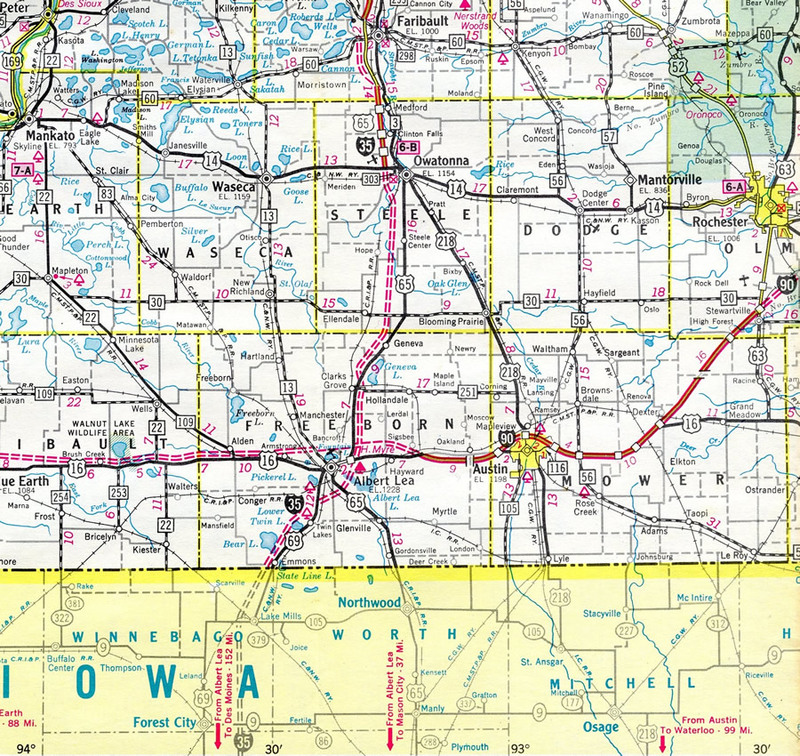 Early Interstate system maps show Interstate 35 proposed along the U.S. 69 corridor from Iowa to an overlap with Interstate 90 across Albert Lea. 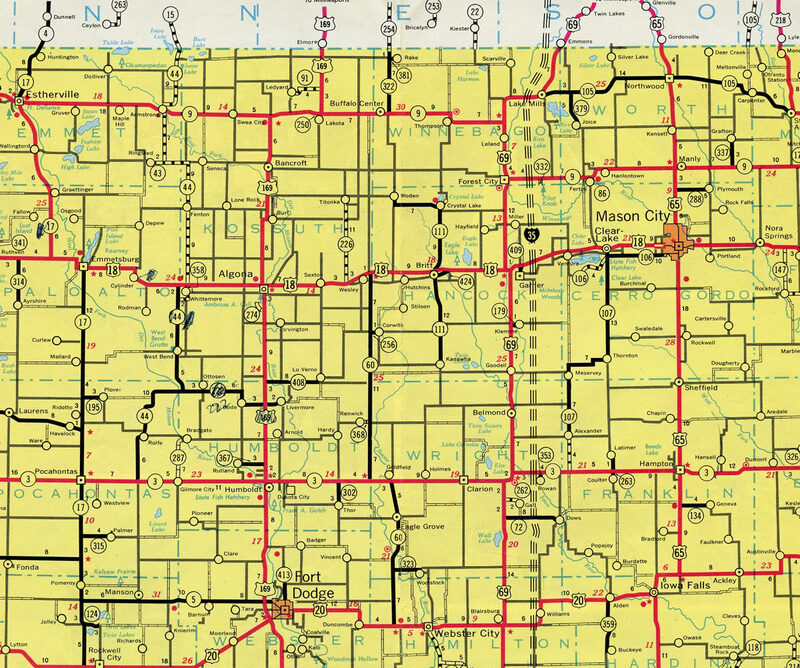 The overlap between Interstates 35 and 90 was no longer proposed by 1964, with I-35 shifted to the southeast of Albert Lea. 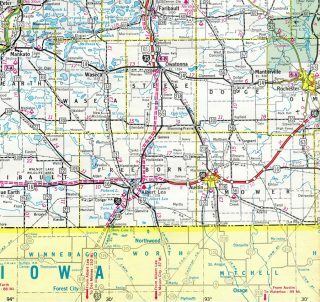 Another change was made by 1965 when I-35 was realigned again to run south midway between U.S. 65 and 69, coinciding with the Iowa change of the freeway corridor. 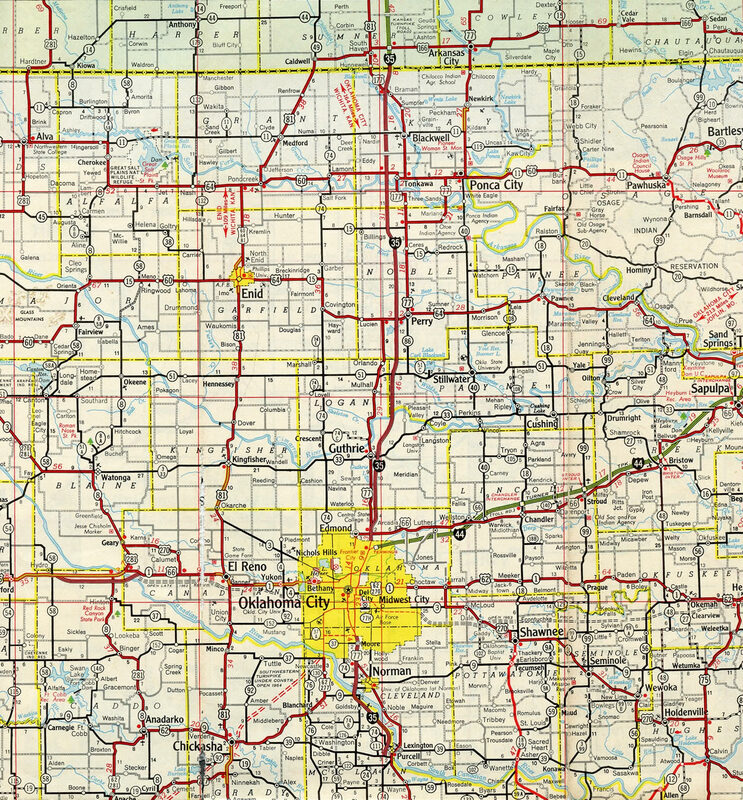 The section of Interstate 35 that overlays the Kansas Turnpike was constructed in 1955 and 1956, with the entire turnpike opening on October 21, 1956. Interstate 35 was designated by AASHTO on August 14, 1957, as an original Interstate Highway from Laredo north to Duluth. 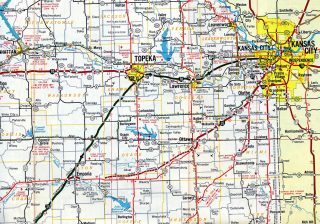 During the late 1960s, most of Interstate 35 (Kansas) from Ottawa to Kansas City (excluding the segment around Emporia) was constructed and opened to traffic. In 1974, the ten-mile section from the Kansas Turnpike around Emporia was completed and opened to traffic. At that time, Interstate 35 was complete in Kansas. Interstates 29-35 & U.S. 71 south cross the Missouri River in Kansas City over the Christoper S. Bond Bridge. Photo taken June 18, 2015. 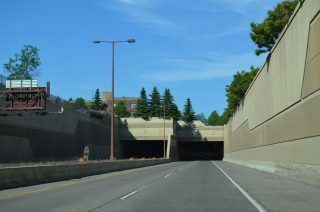 Ramps from the SPUI with Lake Avenue connect with Interstate 35 at the first of four tunnels along the Duluth lakefront. The freeway passed below Lake Place park here. Photo taken 06/14/15. A flyover ramp ties into Interstate 35 north from parallel Michigan Street as the freeway enters a tunnel below Superior Street and the Fitger’s Complex. Photo taken 06/14/15. 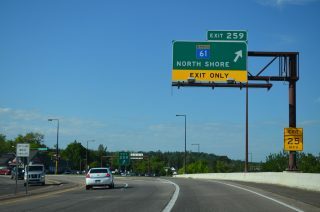 The last northbound reassurance marker stands one mile south of the half diamond interchange (Exit 258) with 21st Avenue East. 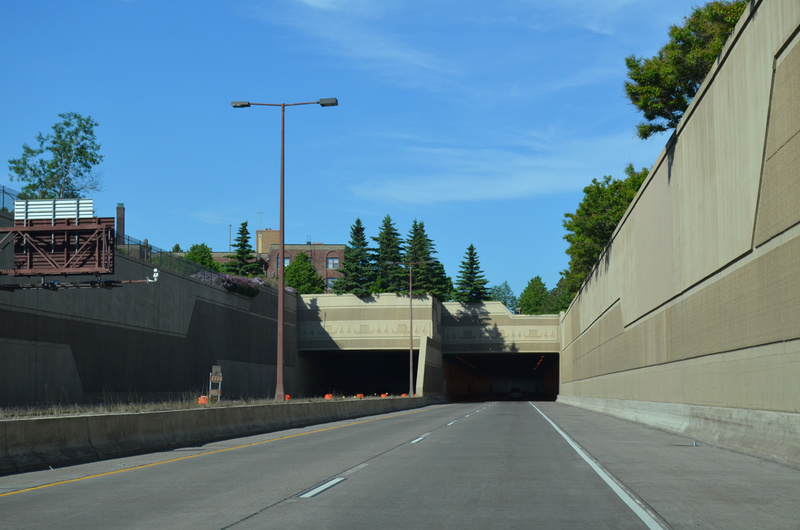 A third tunnel takes the freeway below Superior Street at North 8th Avenue and Jay Cooke Plaza. Photo taken 06/14/15. The final tunnel along northbound kinks I-35 eastward below London Road, Leif Erikson Park and The Rose Garden. Photo taken 06/14/15. 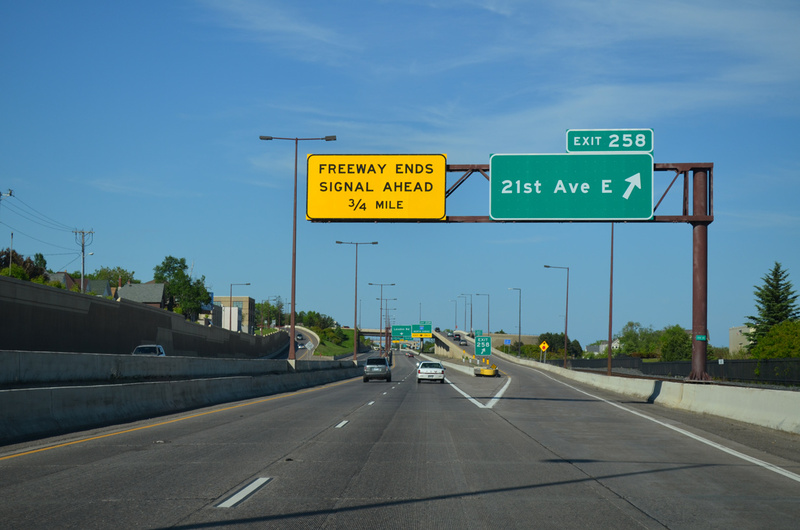 Exit 258 parts ways with Interstate 35 north for 21st Avenue East. 21st Avenue East spans I-35 to the Beacon Pointe Resort and The Ledges community along Lake Superior and west to Woodland Avenue through the Duluth residential street grid. Photo taken 06/14/15. 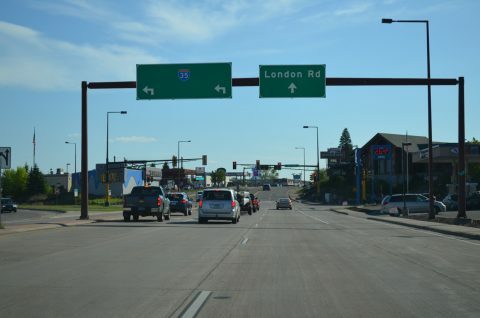 London Road, the former alignment of U.S. 61, parallels Interstate 35 one block to the west to the northern terminus of the freeway. Minnesota 61 lines the road north from there to the North Shore. Photo taken 06/14/15. 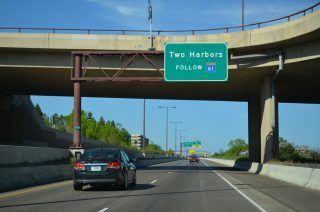 Minnesota 61 follows old U.S. 61 northeast 24 miles to the city of Two Harbors. 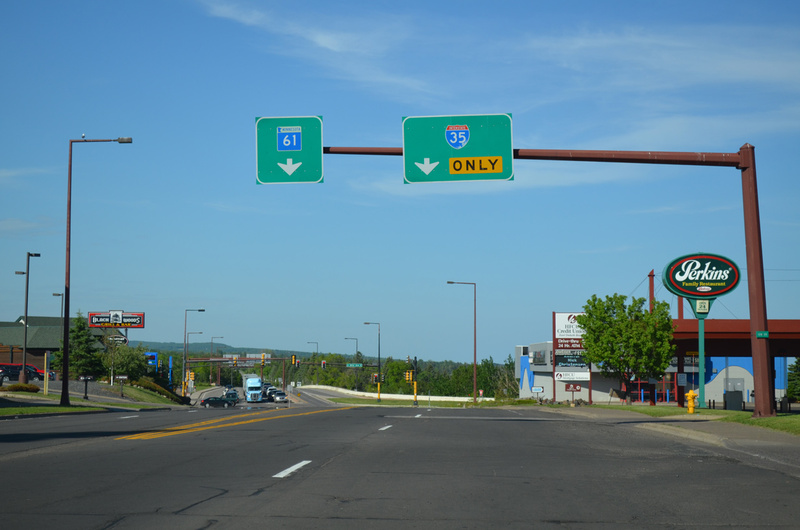 The trunk highway constitutes an expressway from north Duluth to the Lake County seat. Photo taken 06/14/15. 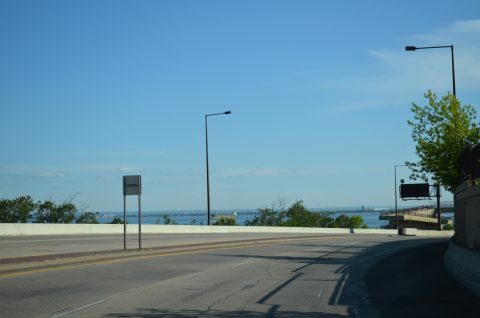 A pedestrian bridge crosses over I-35 between Edgewater Resort & Waterpark and The Lakewalk, one quarter mile south of the signalized end of Interstate 35 at London Road. Photo taken 06/14/15. 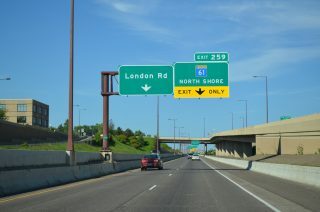 An end sign for Interstate 35 precedes the Exit 259 turn onto MN 61 (London Road) north. Photo taken 06/14/15. Curving north, motorists approach the commercialized intersection with 26th Avenue East and London Road. Photo taken 06/14/15. Minnesota 61 commences a 149-mile route to Grand Portage and the Canadian border as I-35 ends. Connections with Kings Highway 61 lead motorists north to Thunder Bay, Ontario. The trunk highway replaced U.S. 61 when it was decommissioned in 1991. Photo taken 06/14/15. 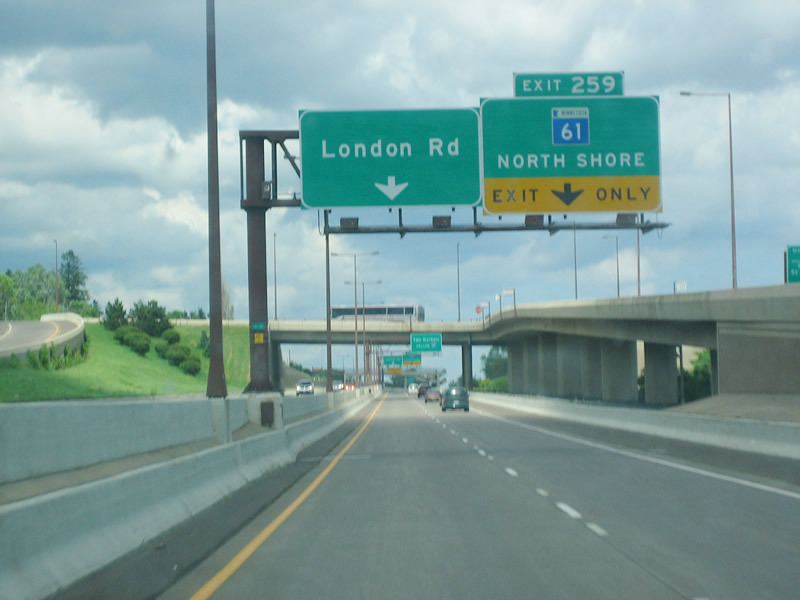 Exit 259 consists of just a free flow right turn lane onto Minnesota 61 (London Road) north. 26th Avenue East stems northwest from the freeway end to East 8th Street while London Road south forms a commercial boulevard leading southwest. Photo taken 06/14/15. Minnesota 61 (London Road) expands to four lanes south of 32nd Avenue East on the approach to Interstate 35. 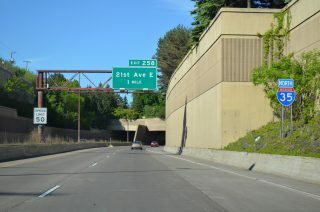 The boulevard rises above The Lakewalk to intersect the freeway beginning at 26th Avenue East. Photo taken 06/14/15. A dual turn lane connects the ending Minnesota 61 with the southbound beginning of Interstate 35 London Boulevard continues along the former U.S. 61 alignment as a commercial boulevard toward Downtown Duluth. Photo taken 06/14/15. 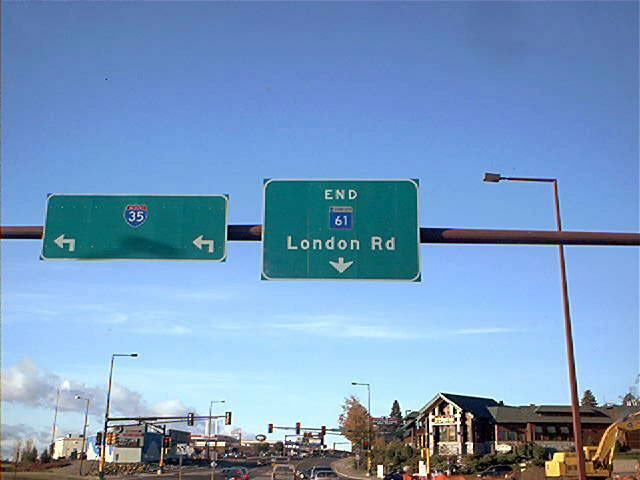 London Road parallels Interstate 35 north from Leif Erikson Park to the northern terminus at 26th Avenue East. Minnesota 61 begins and lines London Road from here to Congdon Boulevard at the Lester River. Photo taken 06/14/15. A lane drop defaults motorists onto Interstate 35 south back toward Downtown Duluth as London Road intersects South 26th Avenue East. Photo taken 06/14/15. 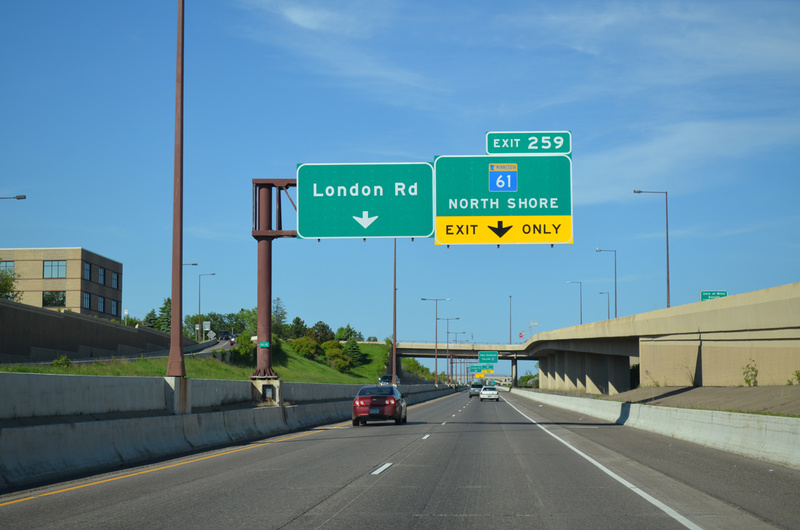 Interstate 35 begins and curves away from London Road and MN 61 to run along side The Lakewalk and Lake Superior. Photo taken 06/14/15. The first reassurance marker for Interstate 35 south. 21st Avenue East passes overhead in the distance. Photo taken 06/14/15. The signs at the 21st Avenue East off-ramp (Exit 258) were replaced by 2008. Lighting fixtures were also removed. Photo taken by Don Greiskalns (05/01). 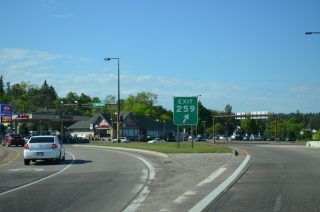 Exit 258 rises to intersect 21st Avenue North as I-35 defaults to Minnesota 61 and London Road. This set of overheads was replaced after 2008. Lighting fixtures were again removed. Photo taken by Patrick Lilja (07/03/05). 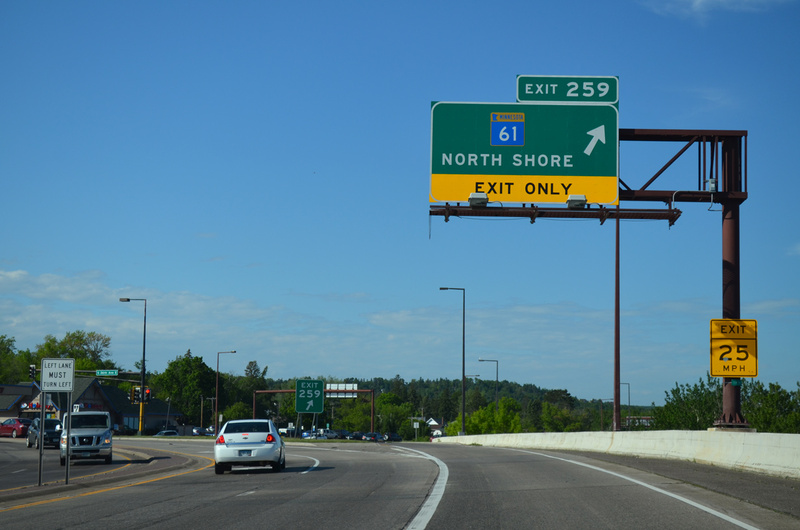 Replaced guide sign for Minnesota 61 (London Road) and Exit 259 at the northern terminus of Interstate 35. Photo taken by Patrick Lilja (07/03/05). 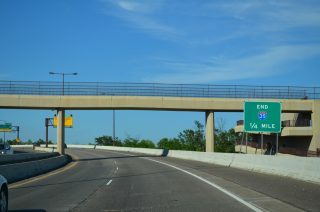 The end sign for Minnesota 61 posted at the turn for Interstate 35 south was replaced by 2008. Photo taken by Don Greiskalns (05/01). The last reassurance marker for Interstate 35 south is posted at the Jefferson Street under crossing. Photo taken 09/27/07. 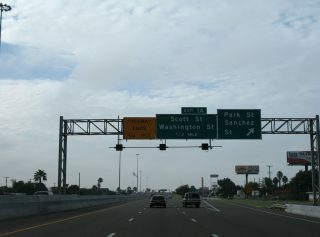 The second to last southbound exit from Interstate 35 departs for Park and Sanchez Streets by the Laredo Civic Center. 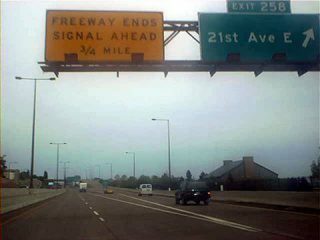 The freeway ends in 0.75 miles. Photo taken 09/27/07. Exit 1A follows onto adjacent Santa Ursula Avenue for Scott and Washington Streets. 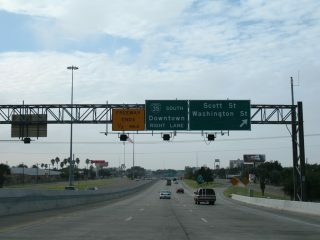 Washington Street connects Interstate 35 with Laredo State University while forthcoming Business Loop I-35 links the freeway end with Downtown. Photo taken 09/27/07. Three southbound lanes continue past Exit 1B as Interstate 35 drops below grade at Scott Street. Speed limits reduce to 45 miles per hour as the freeway concludes in one quarter mile. Photo taken 09/27/07. Traffic at the south end of IH 35 transitions onto Santa Ursula Avenue (Business Loop I-35) ahead of both the couplet of Houston and Matamoros Streets (U.S. 83 & SH 359) and the Juarez-Lincoln International Bridge. 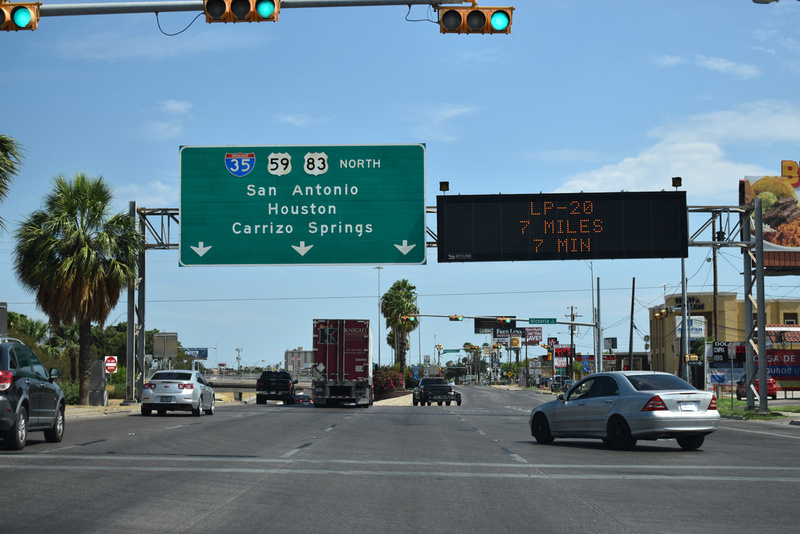 U.S. 83 continues south from Laredo to McAllen, Harlingen and Brownsville, mostly along a two-lane highway, U.S. 83 becomes a part of IH 2 within the Lower Rio Grande Valley. 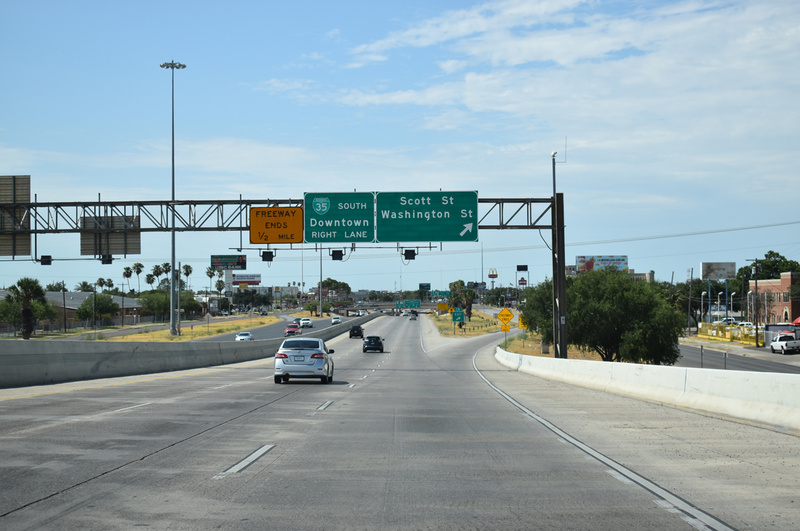 Long range plans call for IH 2 to extend northwest to Laredo. Photo taken 09/27/07. 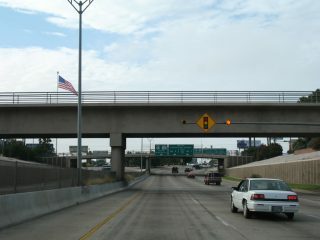 A railroad bridge crosses over IH 35 two blocks ahead of the signalized end at Victoria Street and Santa Ursula Avenue. 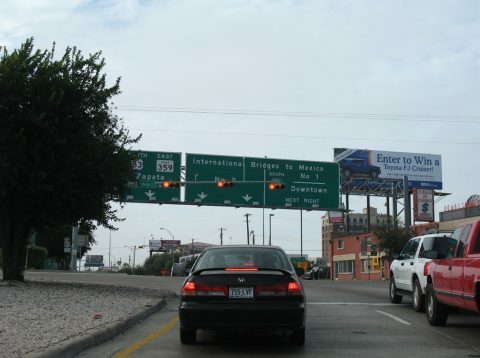 U.S. 83 proceeds two blocks south to Matamoros Street east, where SH 359 begins. Photo taken 09/27/07. 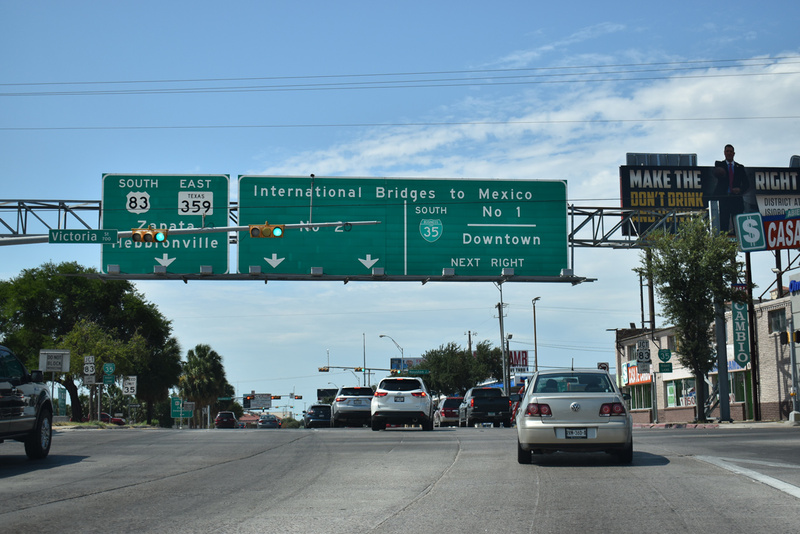 Business Loop I-35 links the ending IH 35 with the Gateway to the Americas International Bridge to Nuevo Laredo at the south end of Downtown. The route navigates five blocks west along Houston Street to Salinas Avenue south and the former end of U.S. 81. Convent Avenue returns the loop northward. Photo taken 09/27/07. 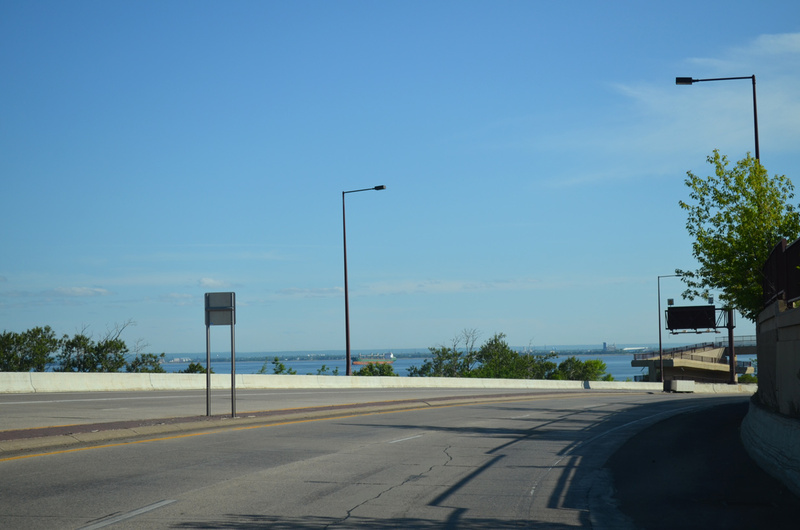 Santa Ursula Avenue carries motorists four blocks south to the Port of Entry. SH 359 connects Laredo with Hebronville and Falfurrias to the east. 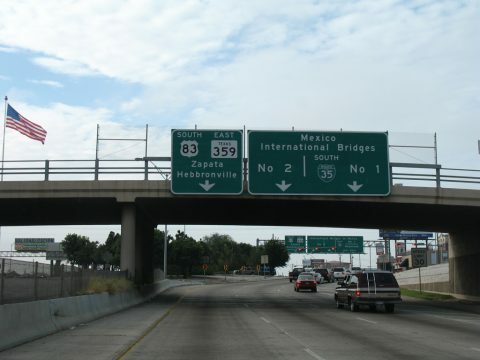 Zapata is located on U.S. 83 southward near the International Falcon Reservoir. Photo taken 09/27/07. 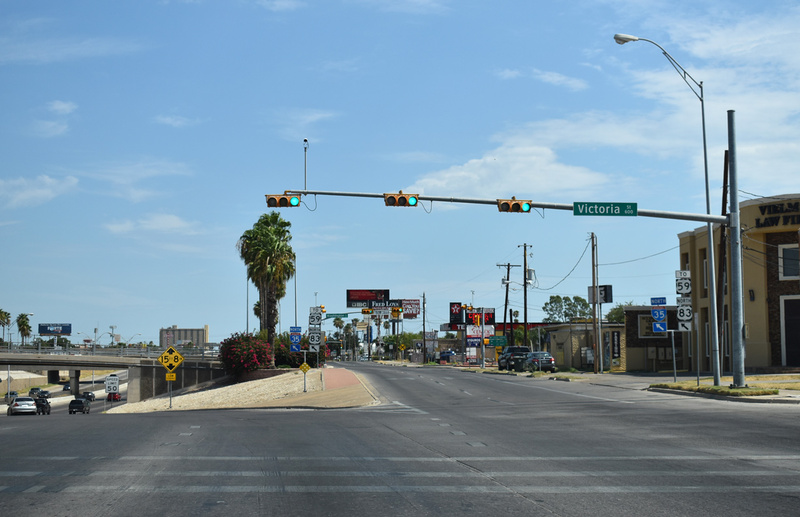 Business Loop I-35 heads east from Downtown Laredo along Matamoros Street and north two blocks on San Dario Avenue to the beginning of Interstate 35. Photo taken by Rich Piehl (12/01). 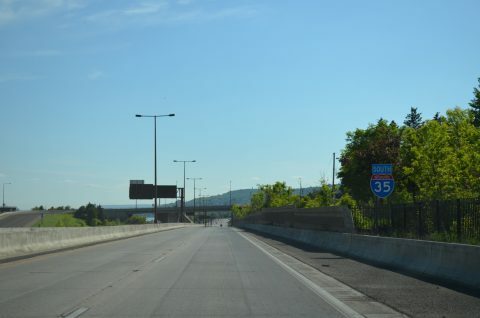 Three lanes depart from San Dario Avenue north onto Interstate 35. U.S. 83 accompanies IH 35 to Exit 18 at Botines. 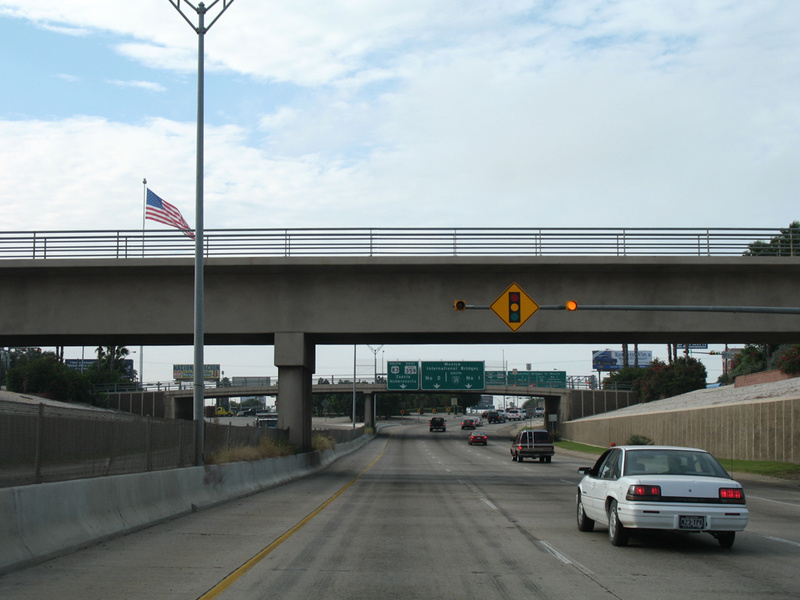 U.S. 59 ties into IH 35 at Loop 20 and IH 69W (Exit 8). Photo taken by Lachlan Sims (04/01). 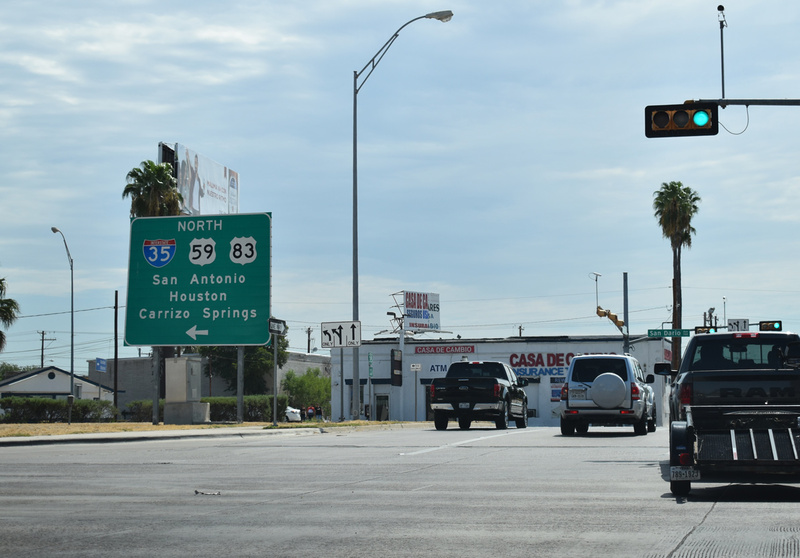 San Dario Avenue forms an east side frontage street to IH 35 northward throughout the city of Laredo. 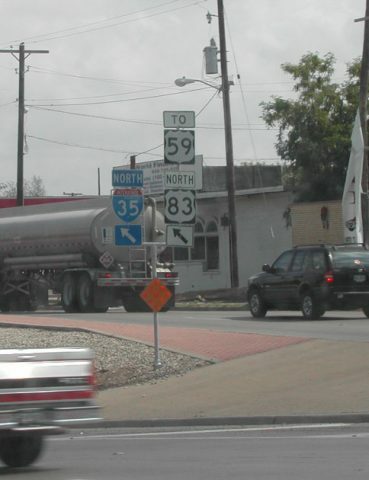 Pictured here are shields for IH 35, U.S. 59 and U.S. 83 at the freeway beginning. 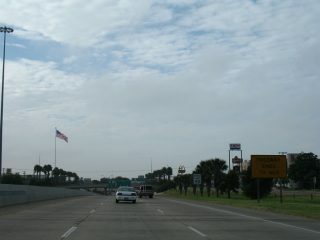 U.S. 59 formerly ended at Exit 2 (Lafayette Street) of IH 35, but was relocated northward when IH 69W was designated in 2014. Photo taken by Justin Cozart (08/02). “I-35 narrowed near Ardmore.” Oklahoma DOT Public Affairs Media Advisory, March 06, 2003. 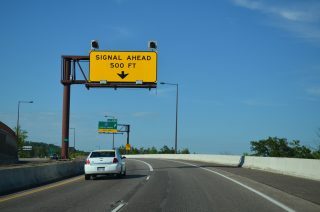 “The long-awaited widening of I-35 to begin!” http://www.okladot.state.ok.us/public-info OklahomaDOT. Copeland, Brian. 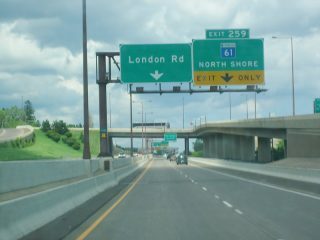 “I-35 in Minnesota designated as Red Bull Division Highway.” Personal email, November 18, 2003. 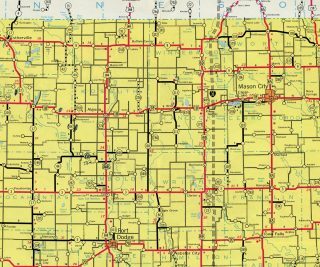 “Iowa Completion Status of Interstate System as of January 1, 1982.” Iowa Department of Transportation. 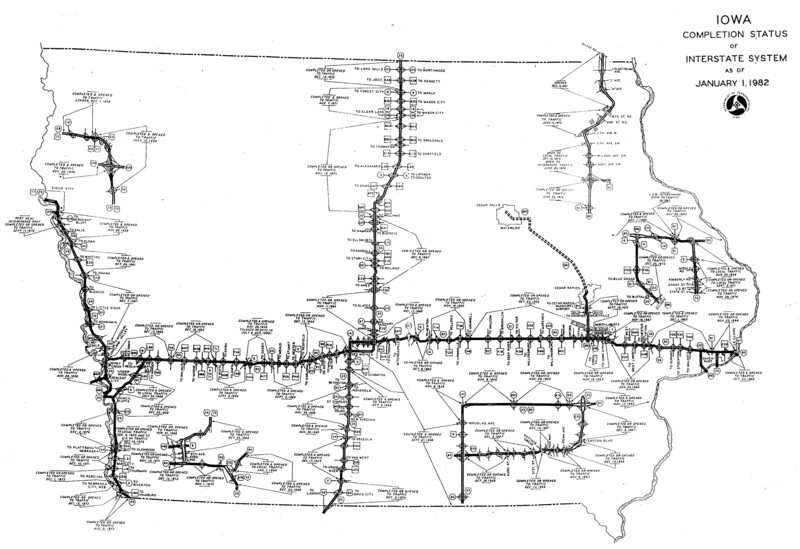 Forty Years of Iowa Interstates. “From Anywhere to Everywhere: The Development of the Interstate Highway System in Texas” http://tti.tamu.edu/interstate_anniversary/white_paper/ by Penny Beaumont, Rhonda Brinkmann, David Ellis, Chris Pourteau, and Brandon V. Webb, Texas Transportation Institute, page 29. Celebrate the Interstate: America’s Interstate Highway System Turns 50! http://www.okladot.state.ok.us/okinterstate50/ by the Oklahoma Department of Transportation. “Duluth opens the first section of I-35 extension.” Star Tribune: Newspaper of the Twin Cities, October 30, 1987. “Section of I-35 opening in Duluth features tunnels, waterfront park.” Star Tribune: Newspaper of the Twin Cities, November 19, 1989. 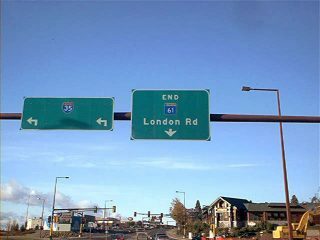 “In Duluth , the end of the road – Final part of I-35 will be opened on Wednesday” Star Tribune: Newspaper of the Twin Cities, October 25, 1992. Kidwell, Brian. “KcICON Quarterly Project Newsletter.” (June 2011). “Famous, Infamous Get Roads, Bridges Named After Them.” NewsOK, October 30, 1983.